The inauguration arm of the Obama transition is organizing a "national day of service" on the Martin Luther King Jr. Day weekend-- itself established as a time to contribute a little something extra to the world around you -- and in it, they're building the architecture for a continuing service corps beyond inauguration weekend. The project echoes the campaign: the inspiration and equipment coming from the top, with the fleshing out of events and projects bubbling from the bottom up. 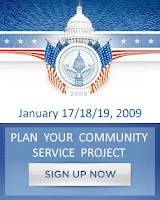 People can create their own events or find local events in their communities on PIC2009.org (PIC = Presidential Inaugural Committee), much like MyBarackObama.com. An email that went out from the transition detailed a pretty broad definition of what sort of events they have in mind: "These can be events that orient people to your organization's work, engage people in direct service, or bring people together to reflect on Dr. King's legacy and how they can commit to becoming more engaged citizens." The whole thing is being headed up by Buffy Wicks, Obama's campaign director in Missouri. If I were staying in New York for inauguration weekend, I'd find ample opportunities to serve near me, with more than 50 events within 100 miles of Brooklyn. There's a food drive at an Arab-American family center and a chance to serve at Housing Works, the AIDS/homelessness center in Manhattan. One particularly neat event: Biscotti per Carita, which seems to roughly translate to "biscotti for charity." Children and their families from an Italian school in Yonkers are bringing the cookies to children and seniors in area hospitals. Cambiamento! All the events go into a central database on the PIC site. (You'll need a PIC account to participate.) By default, events are capped at 100 miles from your location. But through a bit of URL trickery and using as a location Lebanon, Kansas, the geographic center of the United States, I was able to turn up a full list. There are about 460 events planned thus far. Here are the all the events, in XML. Sprinkled among the blood drives and river cleanups are some slightly less obvious sessions. The West Virginia State Auditors Office, for example, is hosting a training session on money fraud perpetrated via mail and the Internet. National Day (Weekend) Of Service - What Will You Be Doing? Barack Obama is calling for a national weekend of service to take place between Jan. 17-19, the weekend preceding Obama’s inauguration as president. Obama is calling on community organizers all over the country to come up with projects and events that will reach out to and improve their communities. Your imagination is your only limit. Planting trees. Cleaning a beach. Feeding the homeless. Painting a school classroom. Delivering meals to seniors. Come up with something -- and make it happen! If you are not already registered on the site, you will need to go through a short sign-up procedure before you can submit your event. Please keep in mind that the event must be non-partisan in nature. Partisan and religious groups are absolutely encouraged to participate, but the events themselves must be non-partisan. For instance, it's okay for a local Democratic Club to organize a food drive, but it's not okay for that same club to organize a rally for a local candidate for office. Once your events are approved (and I'm sure all of yours will be), they will be posted so the general public can search by zip code and sign up for events. The sooner you post the event, the more time folks will have find them! Type in your zip code and the site will find events in your area. Not many events are up yet, but this will change dramatically after January 1st. Barack Obama does not look like any other American president, but more important, his supporters look different from every other president's base. They are the most connected national constituency in history. Presidents have always needed intermediaries to rally their base, from the press to party machinery. But Obama has a direct line--or several--to his most active supporters. "We've never seen anything like this," says Micah Sifry, who runs the Internet politics site TechPresident.com. Obama has "the ability to directly reach millions of people in a very targeted way [and to] activate support district by district." Since the election his aides have been experimenting with how to use the networks, for governance and for postcampaign politicking. On the governance side, the transition team is recruiting people to monitor transition meetings, pose public questions to the staff and share input on selected policies, starting with healthcare. Twenty thousand people participated in the first user-generated press conference, which allowed the public to write and rank questions. The bailout, civil liberties and marijuana legalization were popular topics. The transition team's Internet director, Macon Phillips, said the queries "weren't only ones you'd expect from supporters, which is a good thing." Phillips did Internet outreach for the campaign, but he stressed that the objectives have shifted. "In the campaign we were organizing people. Now it's more conversational, trying to listen and engage people that weren't engaged in the campaign." The campaign thrived on bottom-up participation, with volunteers taking charge of projects, organizing themselves and sometimes challenging Obama's positions. "There's been a lot of hand-wringing about what Obama is going to do with his e-mail list, but that has it a bit backward," says David Dayen, who writes the progressive blog D-Day. "It's really, What is the list going to do with Obama?" Marshall Ganz, the famed United Farm Workers organizer who advised the Obama and Dean campaigns, also argues that the network should not be treated as a list to be managed. Obama won "through the creation of a movement," Ganz observed in a recent YouTube interview, but that does not mean its members can be directed from Washington. "Can he lead it from the presidency?" Ganz asked. "Probably not." This vision is more ambitious than responding to surveys or submitting questions to the administration. To shift presidential priorities, network activists must by definition reach beyond the boundaries of the incumbent agenda. Obama's supporters will have to decide whether fulfilling the movement sometimes means pushing the president, or if such efforts will always be degraded as "counterproductive" by the narrow metrics of tactical politics. In other words, are any issues bigger than Obama? Yesterday, my husband, Warren, and I volunteered our time with "Food On Foot", a non-profit dedicated to providing the poor and homeless of Los Angeles with nutritious meals, clothing, and assistance in the transition to employment and life off the streets. Along with about 50 other volunteers, we spent 3 hours passing out hot meals and new sleeping bags to hundreds of homeless and hungry clients. Both volunteers and clients did their best dealing with the driving rain. The entire operation is staged in an open parking lot behind the Hollywood Gay and Lesbian Center, so there wasn't any way to get out of the weather. Despite waiting and working in these conditions, everyone managed to keep their cool. Volunteers were paired with clients to help them through the line, which meant we got to spend a lot of time with individuals. So instead of a quick "hello" or "Merry Christmas" we actually got to talk to folks and learn a little bit about their lives. We met a family of eight - mom and dad, and six little girls - the oldest was 10, the youngest a newborn. They lived in an SRO downtown and had spent an hour on the bus to get there. The girls were adorable, but heartbreaking. 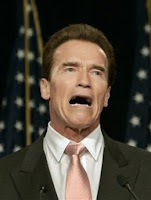 The oldest was clearly in need of major dental work the parents were never going to be able to afford. We also met a group of teenagers, cousins, who made the 4-hour, 6-bus roundtrip journey from South Central for what amounted to just an El Pollo Loco meal, a free sleeping bag, some fruit and a bottle of water. And they were happy to be there. Although there were a lot of singe men in the group, what we saw mostly were families with young children. And it was pretty clear this was the only meal they'd get that day. I have to admit, right off the bat, that I didn't have an issue with Obama inviting Rick Warren to say the invocation on January 20th. I was aware of Warren's involvement in getting Proposition 8 passed, and understood the anger this caused my friends in the LGBT community. But I was also aware of Warren's work to end poverty, his environmental stands, and most importantly, his influence over millions of evangelical Christians (not a few of who are related to me through my husband). I understood Obama's need to reach out to those he and his supporters did not agree with on some issues, in order to find common understanding and to work cooperatively on those issues where we do agree. I get this. And I was ready to let it go. Until I read this. ACCORDING TO THE FIRST three books of the New Testament, Judas identified Jesus to the soldiers by means of a kiss. An act of ultimate betrayal, that peck on the cheek led to the arrest of Jesus. I know how Jesus felt. Well, sort of. 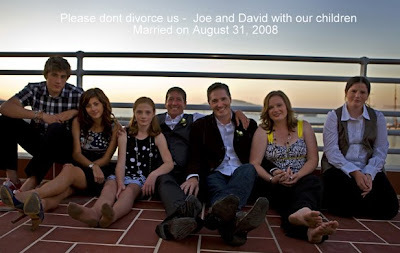 On June 15, 2008, mega-church pastor Rick Warren embraced me and my husband, and each of our three young children. Then, he apportioned his considerable power and influence to eliminate our California marriage. But the story really begins six months before that hug of pretense. In December of the previous year, I wrote a letter to Warren outlining my plan to bring a group of gay and lesbian couples, and their children, to visit his Saddleback Church over Father’s Day weekend. I expressed our intent to attend worship on Sunday, and my hope that he and some families in his congregation would share a meal with us in an effort to reach beyond our differences and focus instead on the commonalities we share as parents and people of faith. In due course, I began a series of phone conversations with Warren’s chief of staff. Over the next several weeks, we agreed that eight of our families would eat lunch on June 16 with Warren, his wife Kay, and six of their staff members. After the family meal, eight people from our group would then convene for a 90 minute conversation with Warren, his wife, and the six other church leaders. Here’s where it gets interesting. The week before our visit, Newsweek senior editor Lisa Miller published an article that contained a single sentence about Warren’s upcoming get-together with a bunch of gay dads. Suddenly, the tone and demeanor from those paid to protect Warren’s public image began to deteriorate. First, we were told that things had changed and Warren and his wife "might" attend the meal and forum. A few days later, Warren posted a message on a religious blog saying that he never intended to meet with our families. Once we arrived in California, I called his chief of staff to discuss final details. Implausibly, I was told that Saddleback had now decided to only feed the eight people from our group who were going to be in the meeting, but not our children or spouses. I pushed back by expressing my opinion that it was not very Christ-like to renege on our covenant after we had already traveled thousands of miles from Texas. "We’ll discuss your visit again and call you back," they said. An hour later they telephoned - this time with a much more serious tone. I felt like I was negotiating a nuclear arms deal rather than the breaking of bread and some fellowship among families. With seeming reluctance, they finally settled on feeding everyone but announced that now only four Saddleback staff members would attend and that Warren and his wife would not be among them. They made a new offer. Warren had decided to preach from one of Saddleback’s satellite facilities, 45 minutes away from the main campus. He would sit down with my family for ten to fifteen minutes after the early service, if we agreed to attend. I accepted that offer and on Sunday morning we waited near our seats at the conclusion of church. Eventually, I heard Warren call out my name. As I turned to greet him, he hugged me, my partner, and our three children . . . and then walked away. No conversation. Minimal eye contact. Just an awkward hug and he was gone. The following day we tried to initiate heartfelt conversation with the four Saddleback staff members who managed to show up. From the opening moments it was clear that this was a meeting to save face without any real interest in hearing our stories or getting to know us. That frustrating experience behind us, my husband and I were married in Malibu the next day as our kids and friends stood watch on the beach. Thanks to Warren and others who worked diligently to eliminate equality with the passage of Proposition 8, our marriage now hangs in limbo. On January 20, Warren will lead the invocation at Obama’s inauguration. I’ll pray with him because our country and our new Commander in Chief need all the prayers we can muster. Afterwards, I’ll say another prayer - this one for Rick Warren. When I’m done, I’ll get up off my knees and keep marching until all people, all couples, and all families have the same civil rights. I won’t quit until the church and its leaders cease spreading fear and misunderstanding about lesbian, gay, bisexual, and transgender people. That’s my purpose driven life. Frankly, there's no reaching a place of commonality with someone so afraid of his own "constituency", his own congregation, he's not willing to reach out to something so non-threatening as a family with small children. No, Rick Warren is another bridge to nowhere. He won't lift a finger to help advance Obama's agenda because he won't risk the backlash from his own people, and the dip in book sales and donations to Saddleback it will bring. Rick Warren is a coward. And as such, useless to the progressive movement. Here's hoping he'll be too afraid to show up in Washington. President-Elect Obama today issued a holiday address that honored Americans serving in the military and those who are struggling due to the economic crisis. He evoked the memory of the "first American Christmas" -- when George Washington crossed the Delaware River -- and called on all Americans today to "renew a sense of common purpose." Obama's `change America' movement is fired up, ready to go. The unprecedented grass-roots organization Barack Obama built in his presidential win appears to be evolving into a nationwide support group to help him "change America." Some of his volunteers from the San Fernando Valley and throughout the country are calling their new community service movement "Obama 2.0." "The job is far from finished, and that's what we're now dedicated to doing," said Peter Rothenberg of Northridge, a co-chairman of Valley for Obama during the campaign. The Valley for Obama organization that registered tens of thousands and said it called millions of voters in key election states has become part of a newly formed nonpartisan community service nonprofit, named CommunityOrganize.com. Its first major campaign, an anti-hunger food drive across California, netted two tons of food gathered in the San Fernando Valley alone. CommunityOrganize.com also raised $1,150 in online donations for the L.A. Regional Food Bank. "We want to continue the work that got us committed to electing Barack Obama president," said Marcia Schneider of Northridge, who is involved with CommunityOrganize.com. .......Obama organizers said the anti-hunger campaign will lead up to a national community service day Obama volunteers have scheduled for Martin Luther King Day, Jan. 19, the day before the inauguration. "We've been told that Obama plans to talk about this community service work during his inauguration address," Rothenberg said. On that day, the Obamas and Bidens will perform community service in a symbolic step to set the tone for the new administration, according to a spokeswoman for the inaugural committee. "We want to find ways to connect people to each other in as many ways as we can," said spokeswoman Linda Douglass. "And our goal is to try to make people in this country be involved in some way." It’s time to put a face to the “Yes on 8” campaign’s shameful legal proceedings. To put a face to the 18,000 couples facing forcible divorce. 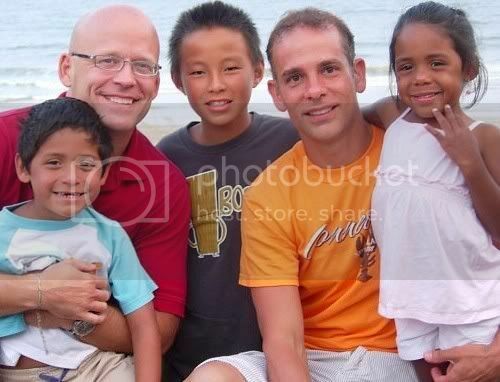 To put a face to marriage equality. Please click through the photos in the slideshows and then submit your own photo, as an individual, a couple or in a group (perhaps with your family over the holidays). Take a picture holding a piece of paper that says "Please don't divorce us," "Please don't divorce my moms,""Please don't divorce my friends, Dawn and Audrey," "Please don't divorce Californians" or whatever you want after "Please don't divorce..." and send it to: pleasedontdivorce@couragecampaign.org. The history of how we got to this point of budget stalemate is that Republicans in the legislature have blocked every single budget and gone back on their own Governor and every negotiated compromise, demanding that all budget shortfalls be solved by laying off teachers, construction workers, DMV workers, firefighters, etc. And through the whole process they have refused to offer any plan for the cuts they demand. But this is explained to the voters as a problem caused by "both sides" or "the legislature" or "refusing to work together" or to "reach a compromise" or "pointing fingers." Some even manage to blame the Democrats for not completely caving in to every single demand! The result is that effective public pressure does not develop to get this solved. "Democrats have to capitulate to GOP demands for the 8-hour work day, meal breaks, looser environmental regulations, permanent budget cuts and a stiff spending cap, among other things. Then, and only then, will Republicans come to the table to discuss -- but not necessarily agree to -- new taxes"
Even if Democrats agree to all of the new demands, then the Republicans demand that we "sell state property!" Note that the entire list of new demands involves more tax cuts for businesses, revoking labor laws, removing environmental protections, removing worker and consumer safety regulations, making a very few wealthy people richer through lower pay for working people, etc. They even want to get rid of meal breaks and overtime pay for employees! These demands have nothing to do with helping regular Californians get through the day, they are about making things harder and less safe for us, just to make a few people ever richer. These stunning new demands have nothing to do with the budget. Read the rest here, and pass it on. It started with yarn. A lot of little balls of colored yarn. Last week, a lot of us in the Southern California Obama campaign gathered for the first time since the election for the mega "Change is Coming" event at LA Trade Tech because we wanted to learn what we could do next. 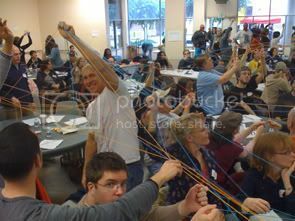 As one of the team building exercises, the organizers had someone at each table grab a ball of yarn and string it to another table across the room to someone else they had met through the campaign. Soon the room was a tangle of blue, yellow, green and orange strings. It's the picture you see at the top of this page. At the end of the meeting, we were all asked to adopt a local food bank. Our group in the northern part of CD36 settled on the Westside Food Bank, those in the southbay and the harbor area adopted The Food Bank of Southern California, His Helping Hand Food Pantry in Lomita and Harbor Interfaith Services in San Pedro. Between the two groups, by reaching out to our Obama networks, our neighbors, Facebook, and Community Organize (a new networking site developed by the leadership of the California Obama campaign), we collected nearly 5,000 lbs - 2.5 TONS - over 8,000 pounds - FOUR TONS - of food, blankets and toiletries, donated a thousand dollars, and recruited dozens of volunteers to sort and box the proceeds. Hi - I just left the Sprint collection site in South Torrance after helping Linda Greene and the Mira Costa team unload their haul. I had already brought in 4 bins and nother zillion bags of food from my two sites, and Linda had even more than I. I was in tears. I feel like I have known Linda my whole life and we just met in person half an hour ago. Thanks to the kids from Mira's Young Dems, my kids, my friends, and all of the Fighting 36th. It was a great experience. My thoughts exactly, Jill! What was a good idea turned into a great success in no small part to the awesome volunteers and incredible generosity of our communities. Really enloyed workig with Jill (Redondo Beach) and Robert (Harbor/San Pedro) and happy to say our teams were able to collect 4,255 lbs. of food and personal care products today! SPECIAL THANKS to the awesome volunteers including Mira Costa High School's "Young Dems Club" and their prez Sam Hein who rallied the troops and worked with a huge smile all day. And to the S-Club members at Mira Costa who manned the tables and collected food donations! Congratulations to our CD36North team and good luck to the other food drives taking place this weekend. YES WE CAN...AGAIN!! Hello Everyone,This is the report for CD36Harbor. It is a beautiful day here in San Pedro. This morning the team went to our adopted food bank to check on things. We were delighted to see their Christmas party was going on. There were hundreds of people with their families enjoying the sunshine, the services and activities provided by the good souls at our adopted food bank, Harbor Interfaith Services (www.harborinterfaith.org). Both their facilities were in full swing. The food pantry on 9th St.served more than 200 families. They left with groceries, most with a turkey, some toys, and a peppermint stick for the kids (the average age of their clients is 6yrs). On 10th St, at the homeless shelter for abused women with children; it was a block party. Janice Hahn arranged for the permit to block off the street for the first time ever. Here there was games for the kids (jumper and all). The tables and chairs began filling up for the big meal to come. Very cool. The team managed to collect about 750 pounds of food, blankets, and things babies' need. We used our lists from the campaign. First we "refined" the lists, called, then followed up with an email. It worked well. San Pedro High School seniors, from Mrs. Karin Bruhnke's government classes (many of whom worked our phone banks) collected 250 pounds for us. For me, the best thing was not so much the supplies we were able to donate, it was the experience of doing it. Working with folks like Tahia Hayslet, the benevolent and caring executive director, or Shirley , her right hand, to all the others who took the time to care enough to do something for someone less fortunate. These contacts are valuable assets . Again it is proven to me that engaged people, working together ignites the desire to get involved and take action. This is good. So what's next? I vote for something that has immediate impact. Something enduring. Any ideas? On the Community Organize site, there are a dozen other food banks happening today all over Los Angeles and California. I can't wait to hear how their day went. And lastly, that site's membership has gone from less than 50 to just shy of eight hundred. Welcome to the "string theory" of community organizing. 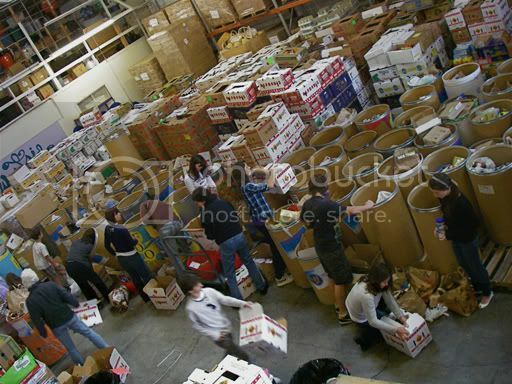 To learn more about the Westside Food Bank, go here. It's an outstanding progressive choice. Solis is the daughter of a Teamster shop steward from Mexico, and a tireless advocate for environmental and economic justice. The Labor Department will be an EXTREMELY different place under her leadership. But I'm bummed that she won't be available to run for Governor. I don't see a movement choice out there now. This is yet another example of California rising nationally and cratering locally. Solis made the right choice, I would say - if you're a California politician, you wouldn't want to work in California at this point. Sen. Gil Cedillo may end up running for this seat, I think a piece of it overlaps his district. 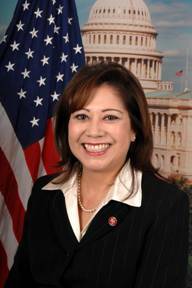 Sen. Gloria Romero is an option as well, as well as Asm. Mike Eng. Hopefully Ron Calderon, a Blue Dog in waiting, won't jump in. The first official post-election action for CD36 will be to adopt the Westside Food Bank for the holidays. Nearly 30 million Americans rely on government aid and food banks to keep food on their tables amid unemployment and rising prices. In LA County alone, demand has jumped 33%, while contributions have dropped precipitously. We will be collecting non-parishiable goods all this week, (for a list of acceptable items,see below) and delivering to the adopted food banks on Saturday, December 20. Our goal is to gather 2,000 pounds, one ton, of food and supplies in the next week! 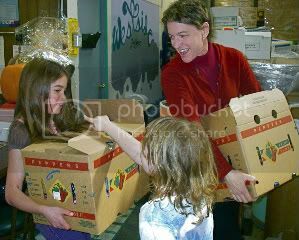 WESTSIDE FOOD BANK: Westside Food Bank supplies food to the food assistance programs of social service agencies in Santa Monica, Venice, Culver City, West Los Angeles, West Hollywood, Inglewood, and the LAX area. drop off times: anytime before next Saturday! We need help transporting food from the Council Office! Please contact Mike Bonin at mike_bonin@yahoo.com if you can help. BE A SORTER! We will be delivering the food at 10am on Saturday morning, and we need folks to help sort the goods! Join us for a morning of fun and friendship! Baby foods are also urgently needed. Sadly, two thousand babies and toddlers are without adequate nutrition each day right here Los Angeles. Blankets are always needed. Clean new or gently used blankets only please. Because our little 800 sq.ft. Venice bungalow is already stuffed to the rafters with furniture, cats, dogs, and various travel keepsakes (I swear that didgeridoo was smaller in Sidney) my husband and I have long since given up traditional gift exchanges this time of year. Instead we ask our friends and relatives to give donations in our names as gifts, and ask them to name charities we can donate to as well. It's a win-win for everyone: our friends get a little tax deduction at the end of the year, the relatives have one less name to angst about on their lists, and we avoid carting cratefuls of scented soap, Hummel figurines, and Thomas "Painter Of Light Crap" Kinkade dioramas to the local Good Will. So this year, with a tough economy squeezing the charities and causes that can least afford it, doesn't it make sense to consider gifts that keep on giving, not re-gifting? The following are some of my favorite causes and charities. Don't see anything here you're interested in? Try the Charity Navitagor to find thousands of different charities! Charity Navigator works to guide intelligent giving. They rate charities by evaluating their financial health, their organizational efficiency and their organizational capacity. DonorsChoose.org is dedicated to addressing the scarcity and inequitable distribution of learning materials and experiences in our public schools. At this not-for-profit web site, teachers submit project proposals for materials or experiences their students need to learn. These ideas become classroom reality when concerned individuals, like you, choose projects to fund. Their data base is searchable by state, county and city. As a scuba diver, this is an organization near and dear to my heart! For over 20 years, Marine Animal Rescue volunteers have come to the aid of entangled or beached whales, dolphins, seals, sea lions and sea birds along the California coast. Marine Animal Rescue volunteers have rescued thousands of marine animals. The Los Angeles League of Conservation Voters (LALCV), formed in 1976, is the only environmental Political Action Committee in Los Angeles County. The mission of LALCV is to participate in the electoral process throughout the County of Los Angeles from an environmental perspective. The Jane Goodall Institute advances the power of individuals to take informed and compassionate action to improve the environment for all living things. It's mission includes increasing primate habitat conservation, increasing awareness of, support for and training in issues related to our relationship with each other, the environment and other animals (leading to behavior change), expanding non-invasive research programs on chimpanzees and other primates, and promote activities that ensure the well-being of chimpanzees, other primates and animal welfare activities in general. A distribution network which provides local non-profit agencies with a low cost, reliable source of food for hungry people in southeastern Michigan. The fastest growing segment of new "clients" come from the auto industry. Habitat affliliates work locally in communities around the world to select and support homeowners, organize volunteers and coordinate house building. Kiva is the world's first person-to-person micro-lending website, empowering individuals to lend directly to unique entrepreneurs in the developing world. When you browse entrepreneurs' profiles on the site, choose someone to lend to, and then make a loan, you are helping a real person make great strides towards economic independence and improve life for themselves, their family, and their community. Give the gift of goats! Heifer provides gifts of livestock and plants, as well as education in sustainable agriculture, to financially disadvantaged families around the world. Heifer works to ensure that the gift of each animal will eventually help an entire community to become self-sustaining. The mission of Packages From Home is to send care and comfort packages to deployed American military personnel who are stationed in active duty theaters around the world, as well as to facilitate activities that elevate morale of all veterans. This nonprofit national charity works to meet unmet needs of the military personnel and their families in the areas of financial literacy, housing and support for the wounded. The mission of the Wounded Warrior Project is to honor and empower wounded warriors, raise awareness and enlist the public's aid for the needs of severely injured service men and women, help them aid and assist each other, and provide unique, direct programs and services to meet their needs. This program is a unique private-public partnership that supports America's military in their time of need. The program recognizes the special sacrifices of our men and women in uniform and the hardships of military service by meeting a humanitarian need beyond that normally provided by the Departments of Defense and Veterans Affairs. Food on Foot began in March 1996 as one man's response to the hunger he witnessed among the poor and homeless of Hollywood. What initially began as the distribution of meals from the trunk of a car has grown through the dedication of its volunteers and now serves more than 500 meals each week to homeless, disabled, elderly and low-income adults and children. Our Volunteer Calendar offers over 60 team-oriented volunteer projects each month that impact the most pressing social issues in L.A. Projects include repairing wheelchairs, serving meals to the hungry, helping children with special needs, reading to kids, mentoring at-risk teens, providing companionship to seniors, landscaping parks and planting trees. VolunteerMatch is a leader in the nonprofit world dedicated to helping everyone find a great place to volunteer. The organization offers a variety of online services to support a community of nonprofit, volunteer and business leaders committed to civic engagement. Our popular service welcomes millions of visitors a year and has become the preferred internet recruiting tool for more than 61,000 nonprofit organizations. Tonight Harry Reid called for cloture on the auto bill, knowing he didn't have the votes. Chris Dodd spoke for working people, and expressed his disbelief that the Senate could let this happen right now (YouTube). Talk about your War on Christmas. Corker of Tennesee then went on to make an impassioned speech about how close they came to a deal, the only sticking point was that the UAW wouldn't commit to a date to accept salary parity with what workers in foreign auto companies make. Mind you, the Republicans didn't ask for commitments from dealers or creditors or bond holders or suppliers, just blue collar workers. So that was really where the only problem was going to arise. Funny, none of these bastards demanded wage and benefit cuts for Wall Street workers in the $700 billion bank bailout. Before the vote, Reid said "I dread looking at Wall Street tomorrow" — with a smile. When I suggested that Reid call their bluff and make the Republicans filibuster and watch as the stock market tanked in their wake, I never thought he'd do it. Gotta hand it to him -- for the time being any way, he's not letting the red state culture warriors railroad the unions. Final vote: 52-35, with Tester and Lincoln defecting from the Dems. Reid says the Senate is now in pro-forma session and they don't anticipate reconvening before next year. We're now in a giant game of chicken. Will Bush and Paulson blink? So, the Republicans are saying that if the Democrats don't agree to destroy the unions, they will block any loans to Detroit, and allow the auto companies to fail. And even that might not be enough to stop them because this wrecking crew seems have decided that the country needs to understand that if they vote for Democrats the Republicans will make them pay by ushering in another great depression. Republicans spent the last eight years like drunken sailors on their first shore leave after years at sea. They wantonly drained the treasury of billions and billions of dollars on harebrained schemes to induce "birthpangs of democracy" around the world, chasing phantom enemies and enriching their defense contractor contributors. They created a lobbying culture so corrupt it finally collapsed of its own weight. They deregulated the financial industry so thoroughly that it created an elaborate ponzi scheme that has just about destroyed the world economy. They have no standing to lecture anyone about responsibility, fiscal or otherwise, and no right to obstruct the cure for the problem they created. It's true that Democrats have, over the years, enabled Republicans and helped their ideology to run amock. But right now they are all we've got and their intentions, quite clearly, are to keep the economy from tanking, if only out of self interest. The Republicans are blocking this bridge loan for both narrow parochial reasons and longterm partisan gain. There's no other way to interpret this otherwise inexplicable unwillingness of the Republicans to even grant a short term bridge loan. They want the economy to fail. PRESIDENT-ELECT OBAMA: Tomorrow, you had mentioned earlier, is when we commemorate Pearl Harbor, and so I'm going to be making announcement tomorrow about the head of our Veterans Administration, General Eric Shinseki, who was a commander and has fought in Vietnam, Bosnia, is somebody who has achieved the highest level of military service. He has agreed that he is willing to be part of this administration because both he and I share a reverence for those who serve. I grew up in Hawaii, as he did. My grandfather is in the Punch Bowl National Cemetery. When I reflect on the sacrifices that have been made by our veterans and, I think about how so many veterans around the country are struggling even more than those who have not served -- higher unemployment rates, higher homeless rates, higher substance abuse rates, medical care that is inadequate -- it breaks my heart, and I think that General Shinseki is exactly the right person who is going to be able to make sure that we honor our troops when they come home. BROKAW: He's the man who lost his job in the Bush Administration because he said we will need more troops in Iraq than Secretary of Defense Don Rumsfeld thought we would need at that time. PRESIDENT-ELECT OBAMA: He was right. "I would say that what's been mobilized to this point, something on the order of several hundred thousand soldiers, are probably, you know, a figure that would be required. We're talking about post-hostilities control over a piece of geography that's fairly significant with the kinds of ethnic tensions that could lead to other problems." Just two days later -- and exactly five years ago today -- then-Defense Secretary Donald Rumsfeld and his deputy, Paul Wolfowitz, swiftly and infamously dismissed Shinseki's assessment. "Massive" effort to make public buildings more energy efficient. These efforts include (but are not limited to) "replacing old heating systems and installing efficient light bulbs." In addition to cost savings, this will create jobs. Job creation (according to Obama, in the millions) by making "the single largest new investment in our national infrastructure since the creation of the federal highways system in the 1950s." Obama plans to apply "a use it or lose it" rule to the allocation of this money. "The most sweeping effort to modernize and upgrade school buildings that this country has ever seen." This includes repairs, energy-efficient upgrades and technology investments. In essence, he wants to create "21st Century Schools," an idea novel to the current President's priorities. He also wants to improve our "information superhighway" and references our abysmal ranking of 15th worldwide in broadband access. As Obama says, "here in the country that invented the internet, every child should have the chance to get online." In addition to connecting schools to the internet, he proposes connecting hospitals. And he talks about modernizing our hospitals with improved technology. Documents from meetings with these groups are available now. Check out the Seat at the Table feature on Change.gov, and dig in. James Dillon, a onetime Republican activist who grew disgusted with politics, was so inspired by Barack Obama's candidacy that he joined the campaign's massive volunteer army, hosting house parties and recruiting supporters. But beyond influencing the November election, Dillon thought he was joining a new political movement that would be mobilized for big goals -- to end poverty or help distressed homeowners, or maybe end the U.S. reliance on oil. So Dillon, a Florida real estate developer, was discouraged by the suggestion that arrived by e-mail last week from Obama's campaign manager: "Excited about the much anticipated first dog?" it read, referring to the Obama daughters' quest for a new puppy. "Support your local animal shelter to give animals in your area a chance." Amid Obama's transition to power, a spirited and often secretive debate has broken out among top campaign staff members over how to refashion the broad network of motivated volunteers into a force that can help Obama govern. With 13 million e-mail addresses, hundreds of trained field organizers and tens of thousands of neighborhood coordinators and phone bank volunteers, the network has become one of the most valuable assets in politics, and Obama's team may choose to deploy it to elect other Democratic officials, or to lobby Congress for his toughest legislative goals, or even to apply pressure on local and state policymakers across the country. This weekend, hundreds of field staffers and some key volunteers are planning a marathon closed-door summit at a Chicago hotel to begin negotiating details of what the network might look like when Obama takes office in January. A group of field organizers from battleground states has been enlisted to draw up a plan. Among the questions to be sorted out by Obama's aides: Who will lead the network, whether it will become part of the Democratic Party infrastructure, and whether it should focus on local service projects or more lofty national goals. Some details have come into focus, according to sources familiar with the internal deliberations. The Obama camp is giving serious consideration to forming a not-for-profit or political-action organization to house the grass-roots machinery. Remaining separate from the Democratic Party might avoid alienating independents and Republicans who backed Obama. It is not clear what form such an organization would take, how it would raise money and how direct a relationship it could have with the White House. Darlene Carter, a Tampa-area schoolteacher and Obama campaign volunteer who is hosting a house party this month, said the network should be nonpartisan. She intends to have Republicans attend the event at her home. "We're looking for a change, and Obama himself has said that it's not about party," she said. Several field organizers and others familiar with the deliberations said they were optimistic that, over time, the network would be successful. "There is a lot of curiosity and even some anxiety around what's going to happen," said one organizer, who requested anonymity due to the campaign's restrictions on talking to the media. "But I think at least the organizers understand that this is going to take a little bit of time." It was billed as the biggest, most eye-popping of the inauguration hotel packages: the JW Marriott's $1 million "build-your-own-ball" offer. You get 300 rooms, four suites, $200,000 worth of food and drink, and a primo site overlooking the Pennsylvania Avenue parade route. This morning, the Marriott is scheduled to announce that the buyer is a Virginia businessman who wants to bring to the inauguration disadvantaged people, terminally ill patients, wounded soldiers and others down on their luck. Stafford said his guests, yet to be chosen, will come from across the country. They can watch the parade from a heated tent atop the Marriott's terrace, with terrific views and every comfort available. "We're not charging a dime," Stafford said. Barack Obama's campaign manager, David Plouffe, is writing a book about the historic election victory and has retained Washington attorney Robert Barnett, Obama's literary representative, to shop the proposal to publishers. The book has been tentatively titled, "The Audacity To Win," a reference to Obama's million-selling "The Audacity of Hope." Having helped manage one of the most sophisticated and highly praised campaigns ever, Plouffe plans not only an inside look at the Obama run but also advice for how to manage a large organization. "Hopefully, there will be some lessons on how to put together a three-quarters of a billion dollar operation," Plouffe said Wednesday, adding that the book would be high on tactics, and low on gossip, with an inevitable critique of the rival campaigns. Plouffe, whose wife recently gave birth to a girl, said he remains in touch with his former colleagues and that Obama is aware of and approves of the book. "His only advice to me was `Don't damage your reputation by writing a bad book,'" said Plouffe, who besides writing his book, plans on working as a consultant and spending time with his family. Georgia Senate Race, Preview Of 2010? 2. Obama accomplished X, but he couldn't accomplish Y and Z because the Republicans obstructed those measures to protect the special interests ... let's put partisanship behind us and elect leaders in Congress who can represent the common good. It's a little funny to see Republicans claiming momentum in the country after an incumbent Senator wins a low-turnout runoff election in Georgia. Lots of us were hopeful that Jim Martin could steal the race, but let's face it, he was running uphill the whole time. Especially because Chambliss ran almost entirely on the concept of "divided government" and obstructing Barack Obama's agenda, which works among Republicans in a red state. They had to have this race and they spent millions to keep it. In Georgia. I'm supposed to be upset? What's notable is that the race was close enough to go to a runoff at all. Yes. Democratic prospects in 2010 will rise on fall on them delivering for the American people or calling out the obstruction. Martin had no access to these messages, and was making them, again, in GEORGIA. While Chambliss' "I'll obstruct everything" message is operative. This is what you can take out of this race - the plain fact that Republicans aren't ready to make nice, that they will block whatever they can block, and that Democrats had better start strategizing ways to get things done. As I write this, with 92% of precincts reporting, incumbent Republican Senator, Saxby Chambliss is leading the Democratic challenger, Jim Martin, 1,113,017 to 809,974. Turnout was light throughout the state Tuesday. A spokesman for Secretary of State Karen Handel predicted between 18 and 20 percent of the state's 5.75 million registered voters would cast ballots — far less than the 65 percent who voted in last month's general election. Martin made the economy the centerpiece of his bid, casting himself as a champion for the neglected middle class. He also linked himself at every opportunity to Barack Obama and his message of change. The Democratic president elect was a no-show on the campaign trail in Georgia but did record a radio ad and automated phone calls for Martin. In the end, Martin, a 63-year-old former state lawmaker from Atlanta, wasn't able to get Obama voters back to the polls in large enough numbers to overcome the Republican advantage in Georgia, which has become an increasingly a reliable red state since 2002. Chambliss' argument that he's needed as a firewall to Democratic dominance in Washington resonated with some voters. Murray Gottlieb, 54, a caterer in Savannah, said he voted for Chambliss because he doesn't want complete Democratic control of the Senate. "I support Barack Obama now. I hope he's the best president we've ever had and we get out of the funk we're in, but I don't want to give him that much power," Gottlieb said after casting his ballot at a church in Savannah. A disappointing night for Democrats. On November 4th, Democrats became the de facto ruling party ... circa 2006 or so, the Dems got very good at figuring out what sort of messaging works when you're in the minority, but that's very different from the sort of messaging you have to do when you're in the majority. There's going to be a temptation in some circles to write this one off to poor African-American turnout or whatever, and that certainly is a large portion of the story. But I think the Democrats need to think carefully about what went wrong here as they begin to gear up for 2010.
a full briefing from your military services and intelligence agencies regarding what they know and what they are doing about extraterrestrial related phenomena" and "formally acknowledge the extraterrestrial presence and finally end the truth embargo after 61 years." Sean Hannity had on his show Prof Gunderson, who has done research on Obama's blood chemistry and its extra-terrestrial origins. Dr Michael Savage has had on his show TWO bio-chemists who have made similar enquiry, and determined that Obama has three chromosones of non-human origin. And then, on Coast To Coast we have learned of the stunning evidence that Obama actually admitted in private conversation, years ago in Chicago, that he is "not of this Earth". He has even admitted it! He must be impeached!! We must continue to amass evidence that not only was he not born in the US -- he wasn't even born on this planet. Seizing our guns is only the beginning. He will soon be going after our time crystals, our ray guns, and our special shelters. This is only the beginning of his Infamy. Sean Hannity is right. There is no limit to what Obama will do to this planet. Why? BECAUSE HE WAS BORN ON ANOTHER PLANET. "What worries you most about the healthcare system in our county?"